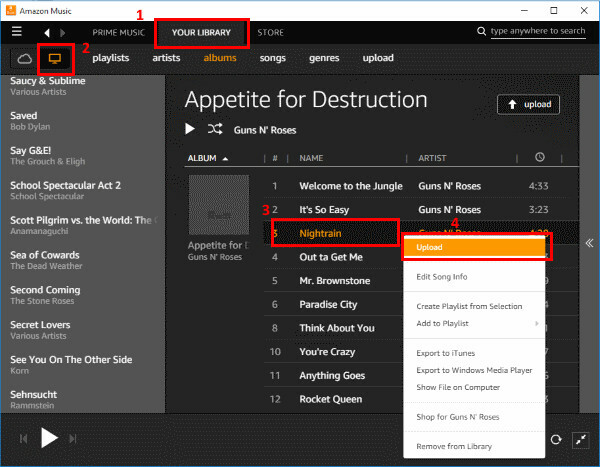 How to Convert iTunes DRM Music to Play on Kindle Fire? “I just got the free 3 month trial of Apple Music. I own an iPhone and got some favorite songs downloaded from Apple Music, I want to play my Apple music on Kindles Fire, but Apple Music can’t work on a Kindle Fire, So how to do it?” Today we will give an answer on how to make your Apple Music play on Kindle Fire. Part 1: Does Apple Music work on Kindle Fire? Part 3: How to play iTunes music on Kindle Fire with Leawo TunesCopy Ultimate? Part 4: How to transfer the converted mp3 iTunes music to Kindle Fire? If you were in the market for tablet, Amazon’s Kindle Fire has always got a decent assessment. Amazon’s Fire OS is derived from Android, and it runs some Android apps, so it is only Android compatible. Briefly, a Kindle Fire is an electronic media tablet made by Amazon.com. A tablet is kind of like a cross between a smart phone and a laptop. It integrates Amazon apps like the Amazon Appstore, Kindle Store, Amazon Prime, and Amazon MP3. It also features Amazon Cloud Drive and will offer on-demand video streaming. Let’s see what video and audio formats Kindle Fire HD support. Apple Music has a DRM (digital rights management) component just like every other streaming service. This keeps Apple users can get a subscription which means the music you’ve downloaded from iTunes is with Apple Music DRM limited and becomes unplayable if you ever cancel your Apple Music subscription and don’t have iTunes Match to keep it with you. Therefore, if you cancel Apple Music, all that streaming music becomes inoperable. So if you want to play your apple/iTunes music on other device, you should remove the DRM protection from Apple/iTunes music and then you can keep on playing and listening to the Apple/iTunes music files even after you cancel the Apple music subscription. In this case, Leawo TunesCopy Ultimate, a professional iTunes DRM removal is highly recommended here. We know that users can’t directly transfer and play the Apple/iTunes music from iTunes to Kindle Fire since apple music’s DRM protection. The DRM removal application that used to remove the DRM protection from Apple/iTunes music and convert them to Kindle Fire compatible audio format is needed. Today we will introduce multifunctional and useful software to all of Kindle Fire users. Now go ahead to the section below for Apple/iTunes music to Kindle Fire conversion. We highly recommend Leawo TunesCopy Ultimate here. 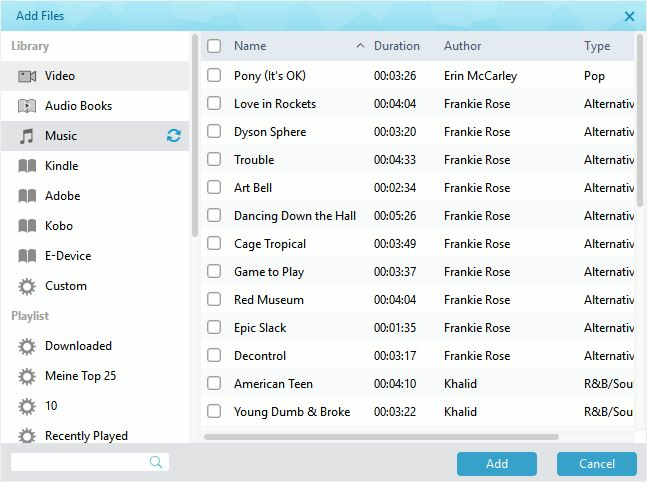 Leawo TunesCopy Ultimate is one useful and multifunctional iTunes DRM removal software to remove DRM from iTunes video, audiobooks, and music as well as convert them to MP4, MP3 at 50X conversion speed with original quality kept. The program is easy to operate, just several clicks you can get a lossless Apple/iTunes music file for Kindle Fire. The following features is about Leawo TunesCopy Ultimate. Please download and install Leawo TunesCopy Ultimate first on your computer and then follow the steps below. Step 1: Add the iTunes music to the program. Click “Add Files” button on the sub-menu bar or “Add Files” button in the middle of program interface to load music songs that you downloaded from iTunes. And then it will pop up a window, which will show you all of songs you have downloaded from iTunes. You can choose any song you want to convert. Choose at least one M4P file and click “Add” to begin importing M4P file from iTunes into TunesCopy Ultimate. 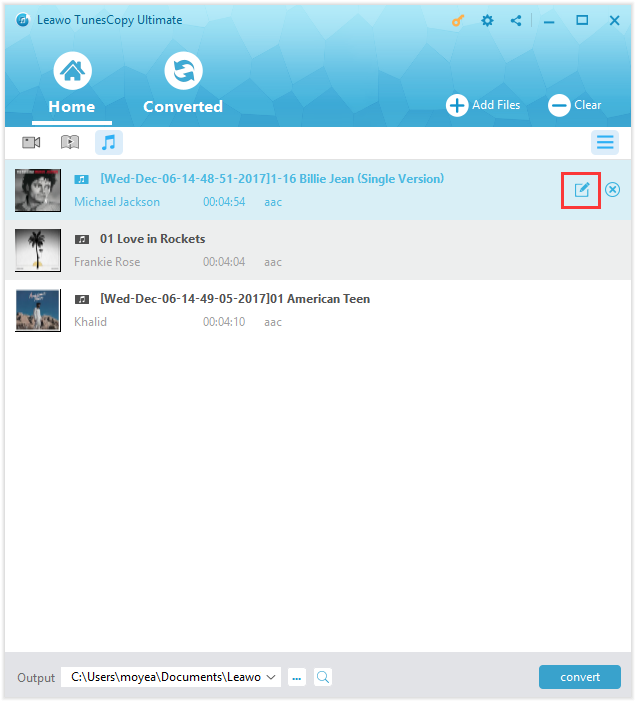 It supports batch conversion so that you can import multiple music tracks to convert once. Step 2: Select Channel, Sampling Rate and Bit Rate. After finish importing the iTunes music files, all files that should be converted can be viewed under the category “music” icon. Before removing DRM from iTunes music, these files are you can edit freely to choose Channels, Sampling Rates and Bit Rates. Clicking “edit” icon in the left of “Home” list to finish this editing steps. Step 3: Set a directory to save the iTunes music after DRM removal. After the successful adding, click “…” button at the bottom of “Home” list to set an output directory. In the pop-up window, you can choose output folder to save the DRM-free Apple Music songs. Please note that currently only MP3 is available to choose for TunesCopy Ultimate. Step 4. Remove DRM and convert DRM-free music to mp3 afterwards. Click the “Convert” button at the bottom right to remove the DRM-ed Apple Music tracks to DRM-free audios. Just a few second, it will succeed. The whole conversion process will keep in silence and the speed of removing mainly depends on the amount of the songs you are converting. Once you get the converted mp3 music from iTunes, you can transfer the DRM-free Apple Music songs to Kindle Fire. 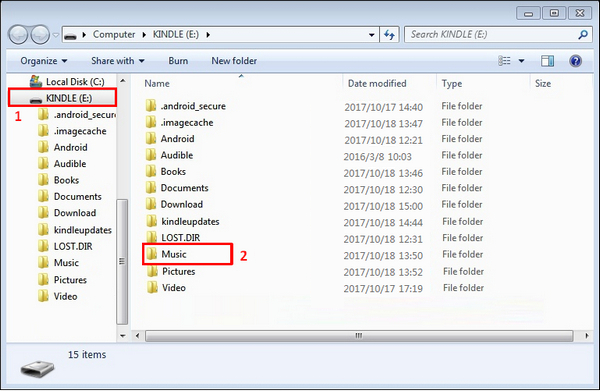 Two ways are available to help to transfer iTunes music to Amazon Kindle Fire tablet for enjoying at any time you want. Step 1: Connect your Fire tablet to your computer via USB cable. Step 3: Open the Kindle Fire drive to open a folder named. Drag and drop your audio files to “Music” folder. Step 4: Disconnect your Kindle Fire. Step 5: Open the Music player. Tap the “Device” option at the top of the screen. Step 1: Launch Amazon Music application on your computer. Step 2: Select the “Your Library” option at the top of the screen. Click it to view the music on your computer in the upper-left corner. Step 3: Click “Nightrain”, and then a pop-up window will be shown to tap on “Upload”. 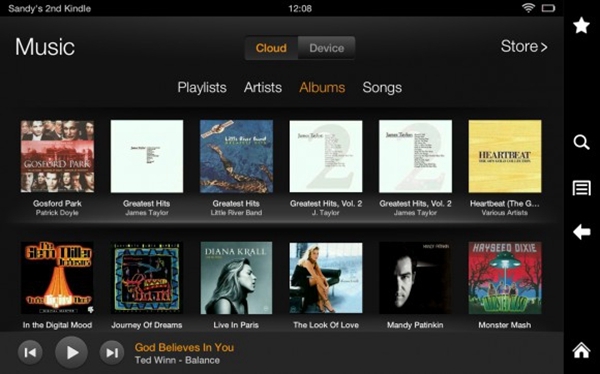 Step 4: The music files will then be uploaded to the cloud and available from your Kindle Fire in the “Music” app. All in all, with this Leawo TunesCopy Ultimate, you are able to enjoy the purchased iTunes music on Kindle Fire with high quality and faster conversion speed. And you will not be restricted by the DRM protection anymore. Meanwhile, you can save the Apple Music forever at any device that you want to play or apply the source music for some personal use. Now enjoy your music now at your will!